I always like to create and adapt recipes to tantalize your tastebuds while not sabotaging your healthy living efforts. As you know I am all for a 80/20 approach, but the 20% needs to be a delicious imperfection. Not some “trash” I often read online. Our body is a temple, not a garbage can! The classic panna cotta recipe is compatible with the Balance Phase of my Healthy Living & Weight Loss program. The vegan panna cotta recipe is compatible with all phases (Detox, Booster, Attack and Balance) of my Healthy Living & Weight Loss program. In a large saucepan bring cream, half and half, the vanilla bean and the seeds, and sugar just to a boil over moderately high heat, stirring. Remove pan from heat and let stand, covered for 15 minutes. In a small saucepan sprinkle gelatin over water and let stand about 5 minute to soften (if you leave it a few more minutes it is not a problem). Do not heat it as I often read! Stir in gelatin mixture and stir until well blended. Remove vanilla bean. Divide cream mixture among eight 1/2-cup ramekins and cool to room temperature. Chill ramekins, covered, at least 4 hours or overnight. 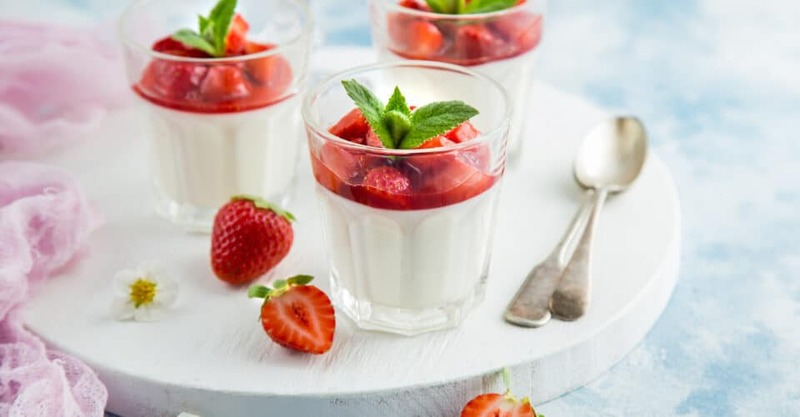 Alternatively, you can keep the panna cotta in the ramekins and serve it plain or add berries, fruits, apple sauce, whatever you live really. In a large saucepan bring cream, the vanilla bean and the seeds, and xylitol just to a boil over moderately high heat, stirring. Remove pan from heat and let stand, covered for 15 minutes.